This year was a tough one in many ways, including for the ocean. For the last four years, I’ve written an annual retrospective listing the top wins in ocean conservation. This year, I couldn’t compile 10 exciting victories. Sure, new protected areas have been created (shoutout, most recently, to Argentina! ), there has been progress toward a U.N. treaty to manage the high seas (shoutout to the High Seas Alliance! ), and new science shows a few strong corals on the Great Barrier Reef can withstand super-hot temperatures without bleaching (shout-out to Terry Hughes, et al.!). Plus there is a lot going on behind the scenes now that will come to fruition in the next few years, including many of the commitments made at this year’s Our Ocean conference in Bali. That work is all critically important and those achievements have been hard fought. But it’s not enough. We still have only 2.2 percent of our global ocean strongly protected, while scientists recommend 30–50 percent. Overfishing continues to get worse—we are now overexploiting over 33 percent of the world’s fish populations, up from 29 percent a few years ago. The ocean has absorbed about 90 percent of the excess heat we have generated by burning fossil fuels; lobster are fleeing the warming waters of Long Island Sound and Maine for Nova Scotia. The ocean has also absorbed around 40 percent of the carbon we have released into the atmosphere, leading to ocean acidification; we have changed the pH of the entire ocean! Wild. The lack of major ocean conservation victories in 2018 is not for lack of trying. Scientists have done an incredible job of arming us with information, and the conservation groups keep chipping away at it. But it hasn’t been enough. Politicians have been meek and corrupted, corporations have too much unchecked power, and we the people are not pushing either group hard enough … yet. This year, instead of lowering the bar to fill up a list with 10 items, I’m raising the bar. Although it’s a shorter list, these are three things to be extremely excited about, and to aspire to surpass in 2019, when I hope we will have a longer list of things to celebrate. New leadership from women and young people. The first politicians to support the Green New Deal were mostly young women. The activists leading Sunrise Movement and This Is Zero Hour are all young and are mostly women. The leadership teams of the Monterey Bay Aquarium and Ocean Conservancy are mostly women. The creator and lead of MIT Media Lab’s new Open Ocean Initiative is oceanographer and explorer Katy Croff Bell, who just chaired the 2018 NOAA Ocean Exploration Forum. The new CEO of the New England Aquarium is Vikki Spruill. The new head of the ocean program at Center for American Progress, Miriam Goldstein, is a young woman. The people leading the zero-waste movement, like Lauren Singer, are mostly young women. The team of experts at Ocean Collectiv is all women. Myriad successes in the fight against plastic pollution. 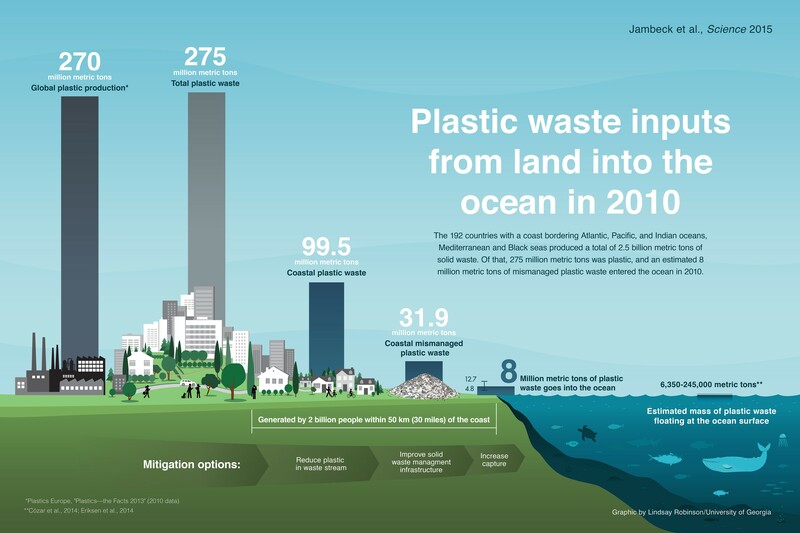 As I’ve written here before, “we need to kick our addiction to plastic.” About 8 million metric tons of plastic enter the ocean every year—that’s one metric ton every four seconds! And the latest research shows that plastic pollution is so pervasive that people all over the world have microplastic in their poop. We have thoroughly polluted our food chain, from tap water to seafood, from table salt to beer. But the tide seems to be turning: The word of the year was single-use! The culture is shifting. Small, local ocean conservation groups are incubating new leaders and fostering an intersectional movement, connecting the dots between ocean health, human health, climate solutions and social justice. Yes, it’s all intertwined. Let’s make 2019 the year of radical expansion of regenerative ocean farming of seaweed and shellfish—grow nutritious food, absorb tons of carbon, provide good jobs, and restore ecosystems. Let’s make 2019 the year we stop ignoring scientists when their research results are inconvenient to current modes of exploitative capitalism—real talk, catching fish faster than they can make babies is a sure way to run out of fish. Let’s make 2019 the year we stop the unfettered flow of plastic from rivers out to the sea — it’s hard to clean up once it’s out in the ocean, but it’s actually pretty simple to prevent at the coast (hello, Mr. Trash Wheel!). Let’s make 2019 the year we go HUGE with protected areas, and leap from 2 percent to 20 percent of the ocean fully protected—or at least to double digits. Let’s make 2019 the year we start really holding our elected representatives accountable for restoring and protecting our ocean, and holding corporations responsible for the damage they cause. There is so much potential. So much is possible. As the United Nations’ Intergovernmental Panel on Climate Change states: “Every action matters. Every bit of warming matters. Every year matters. Every choice matters.” Next year, let’s build stronger collaborations, push harder and win bigger. The ocean’s well-being and ours depend on it. Ayana Elizabeth Johnson, Ph.D. is a marine biologist and founder of Ocean Collectiv, a consulting firm for conservation solutions grounded in social justice. She is also an adjunct professor at NYU, native of Brooklyn and @ayanaeliza on Twitter.